Three two-year-old maiden races. Very pressed for time this evening so I will try to make this quick. This maiden stakes is over 1m on standard going. Thirteen two-year-olds take part: ten colts and three fillies. Seven horses with race experience, half dozen fillies are thrown in for good measure. The betting suggests this is an open affair. Seven juveniles priced under 10-1 with this first betting show. Amanda Perrett's Intermodal was all the rage on debut when a beaten favourite at Lingfield. This bay colt is a son of Rail Link and homebred for K. Abdullah. This February foal was much too keen. That added to inexperience made that first start difficult but Intermodal did hint a winning debut but then out sprinted by others to finish fifth, losing by half a length, in a blanket finish. That wasn't the strongest of races with the second and fourth well beaten on their next start. Clearly, connections expected a big show from Intermodal because Perrett doesn't have many two-year-olds debutantes starts at such short odds. A plum draw may prompt Havlin [jockey] to press on although he wouldn't want to be slow away or keen. From a statistical point of view, has fair claims. Makaarim is trained by Marco Botti. He has been in good form this all-weather season and his debutantes can hit the mark. This son of Tamayuz has each-way claims if priced 10-1 and less. Mambo Dancer is worthy of respect. This son of New Zealand sire So You Think was purchased by Mark Johnston Racing for 42,000G at the yearling sales. 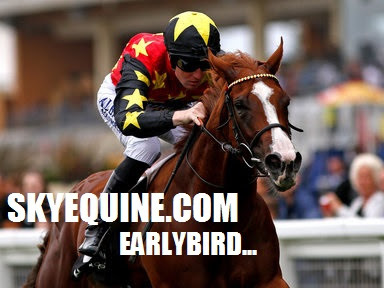 This stable can win with debutantes priced at 16/1 & less. Richard Hannon's Pete So High showed little on debut but flashed ability when fourth at odds of 20-1 behind African Beat at Wolverhampton. Gary Moore fields Sussex Ranger who is a bay gelding sired by Japanese sire Hat Trick. He was purchased for 10,000E at the breeze-up sales. He showed little of the debut but a fair fourth on his second start behind Qatar Man. In fact, the first three are talented horses. Assessing Sussex Ranger's fourth is difficult because you have to consider whether he was slightly flattered by his proximity. A couple of debutantes are found in the betting. Bessemer Lady is trained by Ralph Beckett. He is a handler who can go well with his juveniles at the first time of asking. This Irish-bred daughter of Cacique hails from Chasemore Farm. Sir Michael Stoute sends Button Up. This filly is a daughter of So You Think out of a debut-winning mare who raced at Group 3 level next start, which happened to be the conclusion of her racing career. Bred by Chelston Ireland, she races in the familiar silks and ownership of Michael Tabor. This stable can win on debut although very few are priced over 8/1. Conclusion: The betting suggests this is an open race. Intermodal may be a fair juvenile. He was short priced on debut which is unusual for this stable. It wasn't a bad run but more will be needed. With that valuable experience on side he may go well. From a statistical point of view, this juvenile should hit the frame. I am always slightly reserved betting on this stable. A few form horses need to improve if not difficult to assess, while the major debutantes need to be in their respective betting guide to hold sound each-way claims. I would definitely take a watching brief.